At this point, I am more or less done picking my palette and have most of my recipes sorted – including medium and technical paints, no less than 49 Citadel pots and 10 various size brushes are currenly lined up on my paint station. 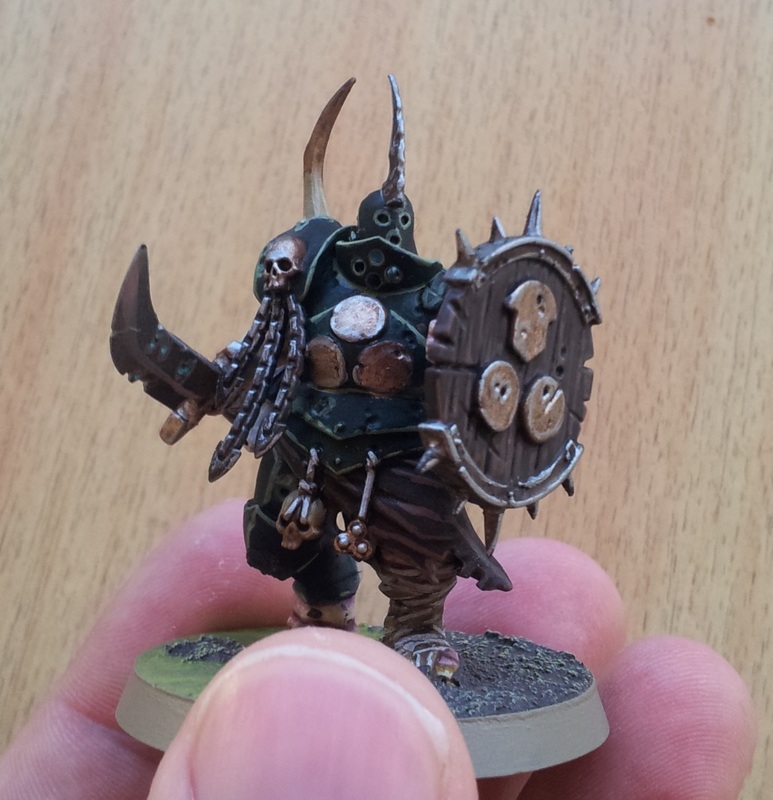 I’ve always hated the Nurgling bases. I think they are stupid, they have poor rules in literally every incantaction of the game, ever, and they look beyond tedious to paint. So having no less than six bases of the buggers from various sources, I felt they were the perfect model to really test my intended recipe for daemon skin. Guess what? They are even more tedious to paint than I imagined. And when looking at the finished product, I aboslutely love them. Expect all six bases to eventually find their way into my finished force. 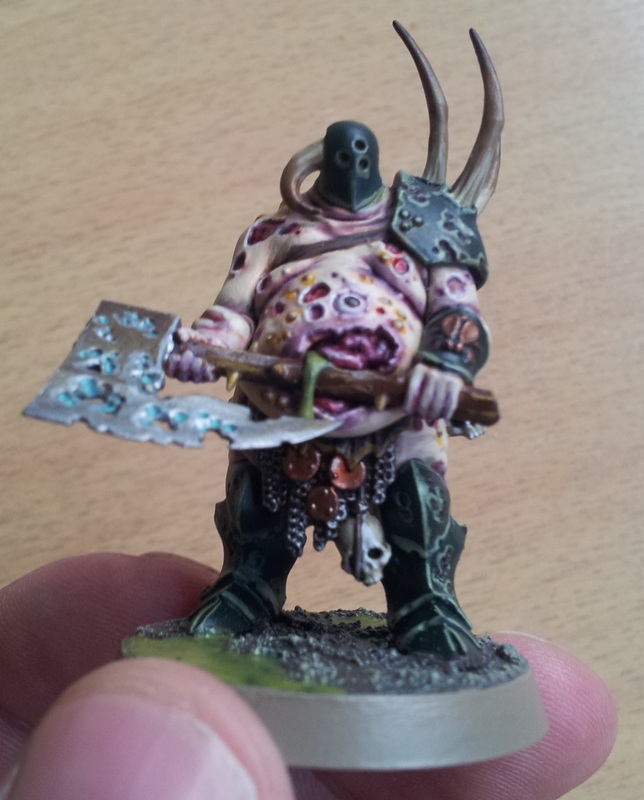 I can’t wait to test the recipe on some Plaguebearers next, and Plague Drones down the road. 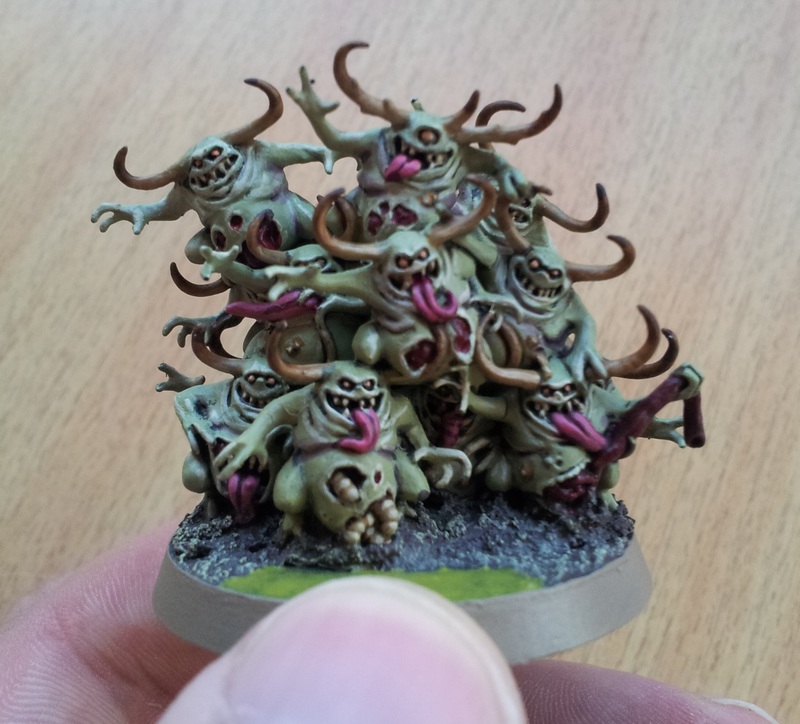 …some Putrid Blightkings. They started out following the exact same formula as the above Lord, but developed slightly underway, perfecting a few recipes. I think they look sufficiently like the Lord, while at the same time having stuff like the wood, brass and skull trophies looking slightly better. 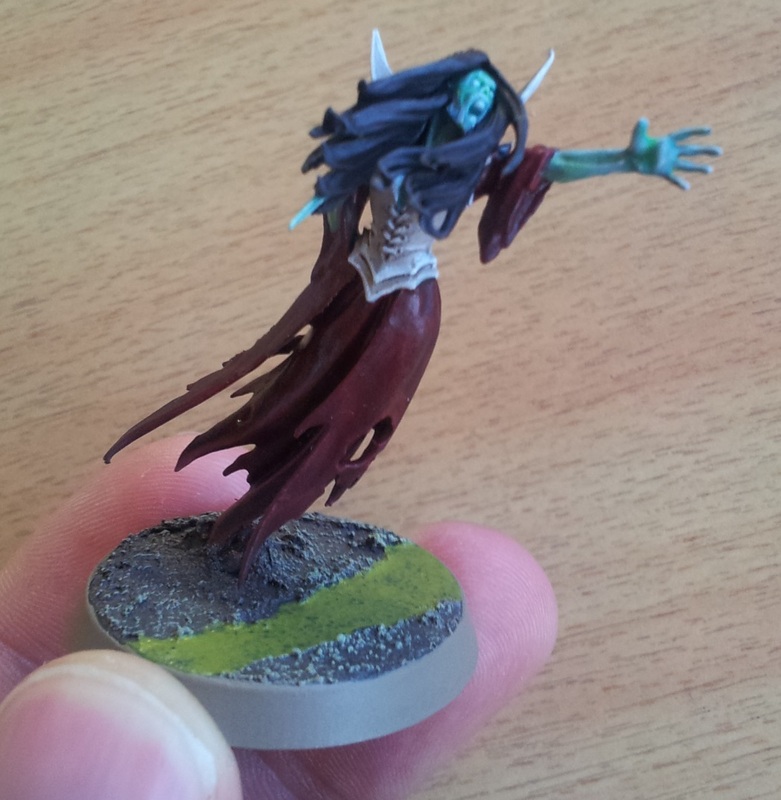 There will be a lot of undead in this army, and given the recent aesthetic design Games Workshop has applied to their undead ranges, there will be a lot of spirits around. 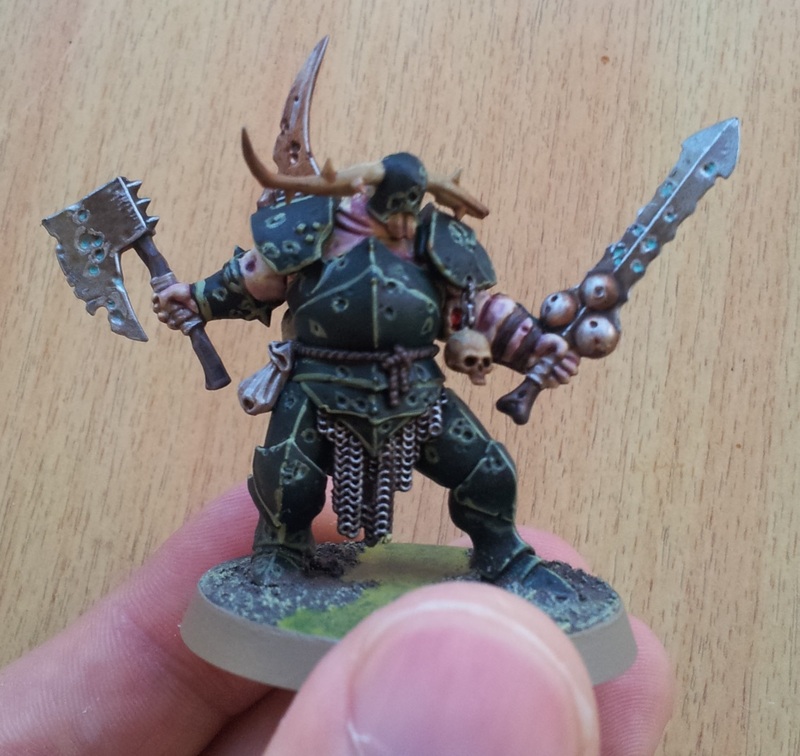 Using the same recipe as the ‘Eavy Metal-team is using for their spirits, with a few slight modifications, I think it looks suitably eerie yet at the same time very much in line with the green of the Nurgle units. I also painted her dressed in blood, with a linen corset, to tie her in with my hordes and hordes of zombies, which I plan to model as the fallen of Talabheim, combining Empire and undead parts. While they will have a more traditional red and white, I still feel this will both set her aside and at the same time tie her in nicely with the other undead. 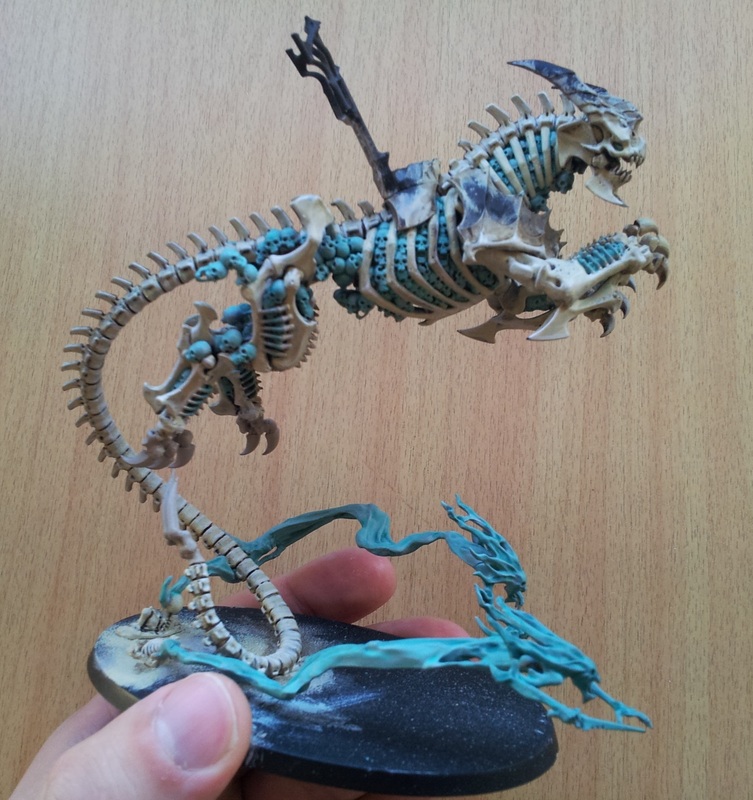 This entry was posted in Age of Sigmar, Neferata, Nurgle, Painting, The Festering Orchard, Undead, Work in Progress and tagged Age of Sigmar, Neferata, Nurgle, Painting, The Festering Orchard, Undead, Work in Progress. Bookmark the permalink.